Boston: Houghton Mifflin. Very Good with no dust jacket. 1921. First Edition. Hardcover. We fit archival quality clear acrylic covers for additional protection whenever possible. 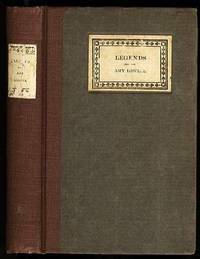 ; 12mo 7" - 7½" tall; xiv, 259, (7) pages; A collection of folklore tales told by Amy Lowell. Original boards and paper labels. In archival acrylic protector of clear plastic. Inscribed to Allan Lowell, editior, at "The Exhibition of Books" National Arts Club, 1921 signed by author. .